South China’s Hainan Province should step up changing growth pattern and pursue a scientific path for economic and social development in efforts to build itself into an international tourist resort, a senior official said. He Guoqiang, member of the Standing Committee of the Political Bureau of the CPC (Communist Party of China) Central Committee, said the island province should significantly optimize its economic structure by quickening the development of the tourism industry and other service industries. 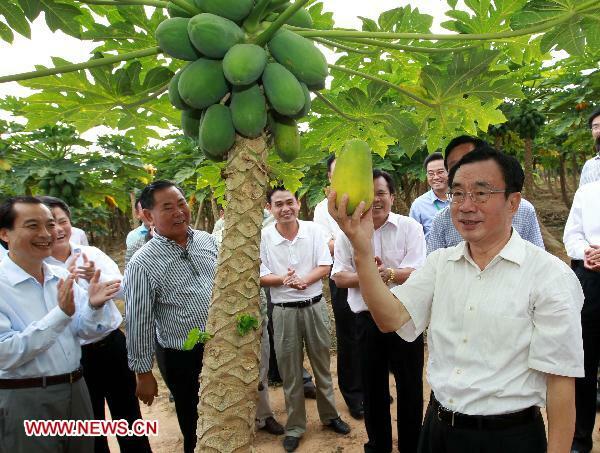 He, also Secretary of the CPC’s Central Commission for Discipline Inspection, said Hainan should give priority to the development of modern tropical agriculture, newly emerging industries, and ocean-related industries, during an inspection tour to the province from Dec. 4 to Dec. 8. He said these efforts would further strengthen the province’s economic power, on which an international resort would be built. The central government announced in January it would develop Hainan into an internationally-recognized resort by 2020. He Guoqiang stressed the importance of good planning in building the resort island and required local authorities to perform enough research and discussions, and to draw upon constructive experiences from home and abroad. He said the island province should also attach greater importance to environmental protection, energy savings, emission reductions, and efficient land use in the development of the tourism industry. Meanwhile, the senior official urged local residents to restore and expand agricultural production after rain-triggered floods wreaked havoc on crops this October in the province. He also ordered local officials to step up construction of water-conservancy and flood-diversion facilities.